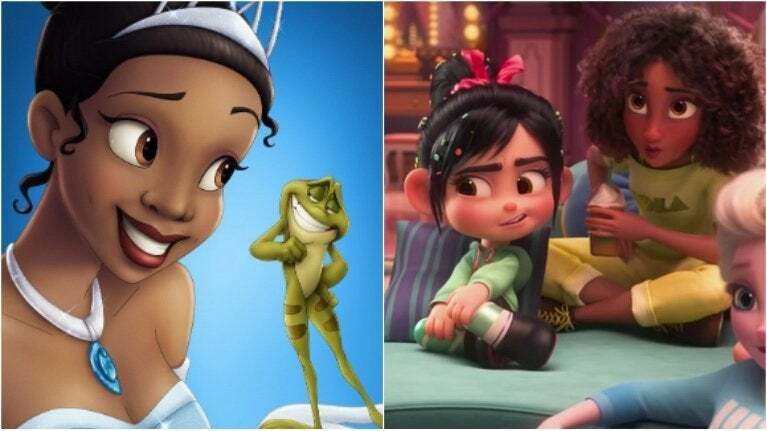 Walt Disney Animation Studios has reanimated scenes featuring Princess and the Frog’s Tiana in its Wreck-It Ralph sequel following social media backlash over the princess’ appearance, the Wall Street Journal reports. Ralph Breaks the Internet finds Sugar Rush racer-slash-princess Vanellope von Schweetz (Sarah Silverman) lounging about with a collection of Disney Princesses, including big dreaming waitress-turned-princess Tiana (Anika Noni Rose). One scene, which shows Tiana and other princesses in a sleepover-like setting, was criticized for Tiana’s chosen hairstyle and her seemingly lighter appearance. Internet users pointed out Tiana, the first black Disney Princess, had improper hair in the Ralph Breaks the Internet trailer and that she now carried the features of a “racially ambiguous” woman. Per the WSJ, Disney animators weighed feedback from returning voice actress Anika Noni Rose and representatives from Color of Change, an advocacy organization focused on issues of racial representation and political inequality in Hollywood productions. Author and cartoonist C. Spike Trotman similarly criticized Tiana’s original look, writing on Twitter “black hair is complicated” and “political,” debuting a Twitter thread intended to help artists avoid making “simple, obvious mistakes” when depicting black hair. Walt Disney Animation Studios releases Ralph Breaks the Internet November 21.